The scores of fans that filled the Ed Meagher Arena Friday night expected something special. They certainly got it. 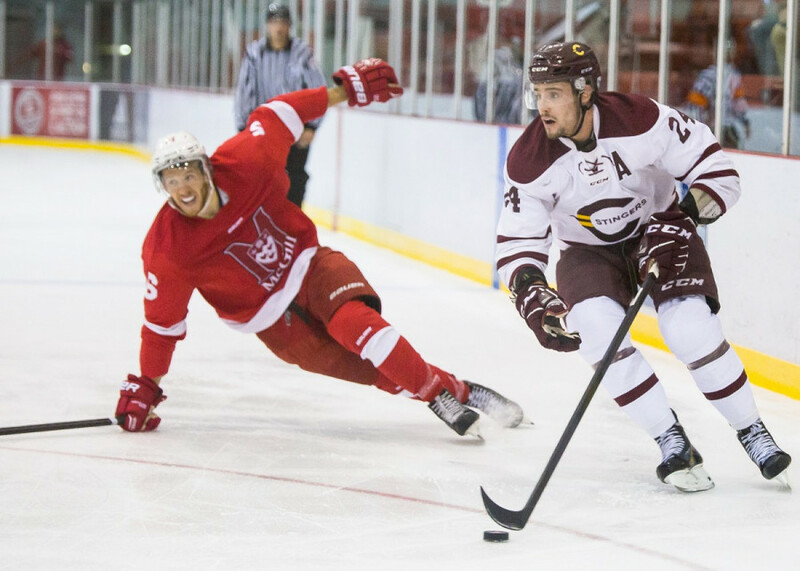 Intensity and pace were high from the drop of the puck as McGill visited Concordia for the rivals’ fourth and final clash of the regular season. After the last three games were decided by a single goal and no team had ever led by more than a single goal, it looked as if the packed arena was in for another tight one. The opening minutes of early skirmishes were interrupted by the first of many Stingers penalties as Philippe Sanche found himself in the box just before McGill found themselves up 1-0 as a result. Playing against a top tier goaltender and a top five offense in the league, Concordia found themselves in a dangerous position. However, it wasn’t long before the usual suspects found a way to make their presence known. As defender Carl Neill rocketed a pass up ice to rookie sensation Massimo Carozza, the forward bobbled the puck, fighting to stay onside and create a two-on-one with U Sports’ leading scorer, Anthony Beauregard. A clever pass and deft backhand later, Beauregard had the game tied, as it would remain until the second period. Related: 2018 Corey Cup Preview. In the second, the physicality and Concordia’s play both seemed to rise with each passing minute. Heavy hits and high quality chances that missed by inches were filling the game. Unfortunately, a lack of discipline was also on the rise for the Stingers. Taking five penalties throughout the period, they found themselves down 2-1 heading into the room. Minutes into the third, McGill’s powerplay rewarded them with yet another goal for a 3-1 lead, the largest lead either team had had against each other this season. There was no sign of despair or giving up on the Stingers bench. The team’s focus was put to good use just three minutes later when forwards Antoine Masson and Sanche created a scrum in front of the net and Charles-Eric Legare roofed the puck to bring his team within one with ten minutes remaining. Related: Anthony Beauregard’s historic 2017-18 season. With less than five minutes left, Concordia’s unproductive powerplay went to work, trying desperately to force overtime. Beauregard blasted a shot towards the net with his captain Philippe Hudon screening the goalie. The Stingers captain deflected Beauregard’s shot right between the goalie’s legs to tie the game. The tie lasted through a tense, exciting overtime punctuated by outstanding saves on both sides. It would take a shootout to end this rivalry game. Marc-Antoine Turcotte stood tall, blanking all three shooters. Both Sanche and Carozza failed to to score. With the puck, and the game on his stick, Anthony Beauregard scored and ended the game. The Stingers play their last regular season game Saturday Feb. 10 at the Ed Meagher Arena against the Carleton Ravens. Full recap with quotes will be up shortly.